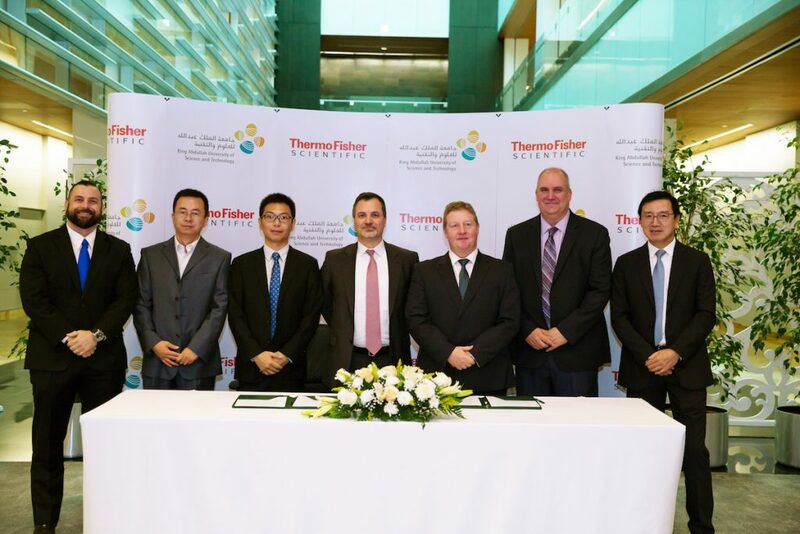 KAUST signed a worldwide agreement with Thermo Fisher Scientific, providing the company access to its two patents that have the potential to expand the range of applications for high-resolution transmission electron microscopy (HRTEM). The agreement further establishes KAUST as a premier global technology university and Saudi Arabia as a regional hub of scientific excellence. “The exchange of knowledge between the University and industry is an important focus for KAUST, and we are always keen to see impact in the economy from the development of our research. 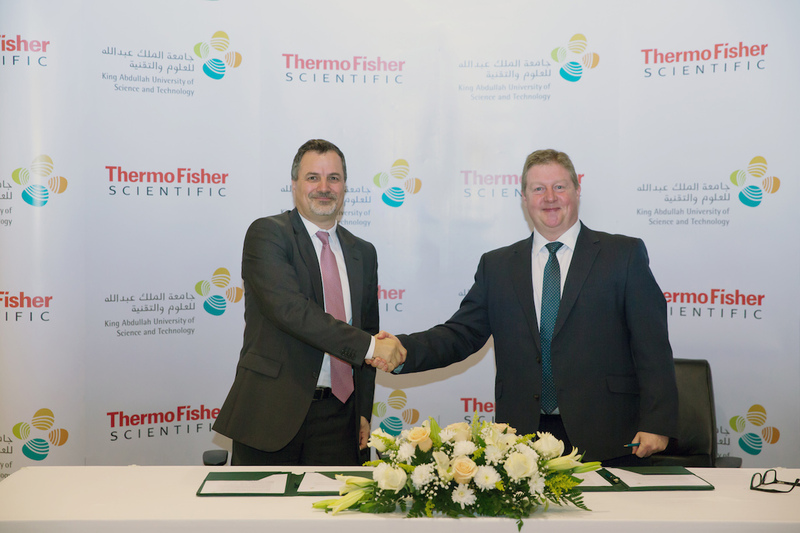 We are pleased to work with Thermo Fisher to bring this exciting new technology to the market,” said Kevin Cullen, vice president of KAUST Innovation and Economic Development. Alberto Tinti Sr. (left), director, sales and business development, Materials and Structural Analysis Division (MSD) – Thermo Fisher Scientific, and Dr. Kevin Cullen, vice president of KAUST Innovation & Economic Development, sign an agreement on campus between Thermo Fisher Scientific and the University. Photo by Sarah Munshi. To understand how atomic structure impacts materials and chemical behavior, researchers often turn to HRTEM. Many compounds, however, are too sensitive for HRTEM microscopes, as powerful electron beams can knock out atoms or cause adverse heating. KAUST scientists working in the University’s Core Labs embarked on a scientific impact project to overcome these limitations by developing a set of tools that can minimize beam damage in HRTEM using low doses of electrons. These inventions enable atomic-resolution transmission electron microscopy (TEM) imaging of electron beam–sensitive crystalline materials, which have traditionally been considered unsuitable for TEM characterization—therefore improving investigations in a wide variety of “unstable” materials using HRTEM. “The application of this technology is not limited to beam-sensitive materials—it is also useful for aligning nano-sized crystals. The essence of the image series alignment method is an amplitude filter that facilitates effective and precise alignment of noisy image series containing periodic features and delivers high quality high signal to noise ratio final images,” stated Dr. Daliang Zhang, a senior scientist in the KAUST Core Labs. Alberto Tinti Sr. (left), director, sales and business development, Materials and Structural Analysis Division (MSD) – Thermo Fisher Scientific, and Dr. Kevin Cullen, vice president of KAUST Innovation & Economic Development, shake hands during the signing ceremony on campus for an agreement between Thermo Fisher Scientific and the University. Photo by Sarah Munshi. Dr. Zhang and other KAUST inventors Dr. Kun Li, Professor Yu Han and Dr. Yihan Zhu patented the suite of methods that deal with automatic crystal zone axis alignment and precise alignment of noisy image series containing periodic features. The automatic crystal zone axis alignment method not only reduces the electron dose but also enhances the precision of alignment. 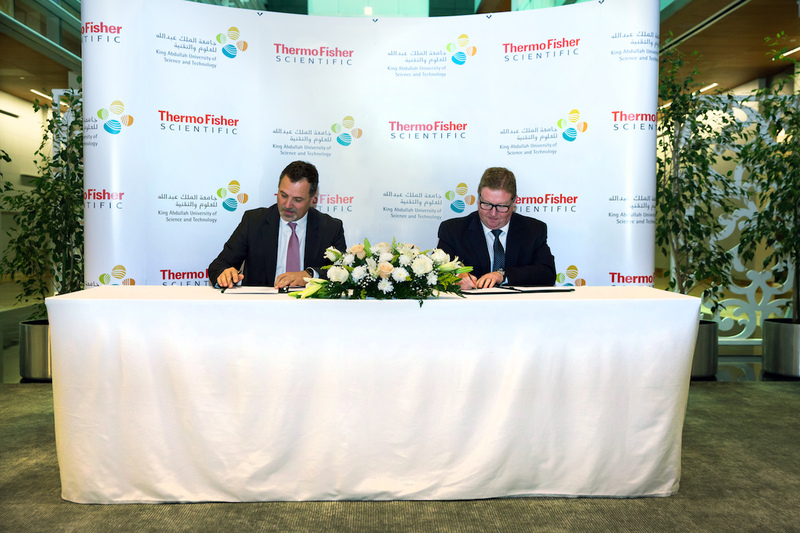 This licensing agreement will strengthen an already established relationship between KAUST and Thermo Fisher. The KAUST and Thermo Fisher Scientific Center of Excellence for Electron Microscopy located on the KAUST campus will facilitate further collaboration in developing and commercializing new technologies to serve science globally. This entry was posted in Industry collaboration and tagged KAUST, press release, Research, Thermo Fisher. Bookmark the permalink.